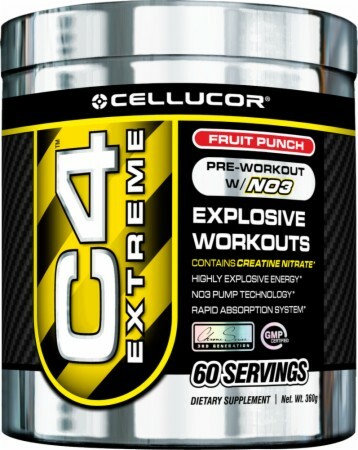 Cellucor’s C4 extreme is one of the best pre workout supplements on the market today. One scoop of this and you are ready to hit the gym floor in 20 minutes and after there is no crash like you get from other brands on the market today. Using some of today’s newest designer supplements makes this one a winner. Creatine nitrate is the main ingredient in this supplement, combining creatine with NO3 to enhance the delivery of the muscle pumping action of C4 extreme. As we all have read NO3 is the lasted supplement that uses L-arginine with a salt nitrate that makes absorption into the muscles a 1000% greater the before. You take NO3 and bind it with creatine and you get something that the fitness world has been missing, creatine nitrate. Not only does NO3 help rush the creatine into the muscle but it uses fat and lipids to help increase nitric oxide in the body along with helping to lose fat. Beta Alanine is also an ingredient present in C4 extreme. Beta alanine works by helps the body to form carnosine . Carnosine acts as a buffer in the muscles to reduce acid build up. This supplement won’t make your one max rep any higher but it will let you get more reps out of your set by improving workout performance and endurance. You know it’s working when you can feel your skin tingle. Don’t worry there’s no bugs under your skin. This is called mild paresthesia it is harmless, just feels weird. Beta alanine is thought to works synergistically with creatine to improve workout performance even better than the two supplements alone. C4 extreme also has caffeine to increase energy and alertness along with B12 and B3 that are part of the energy blend present in the supplement along with L-arginine for vascular dilation one of bodybuilder’s favorites and just wouldn’t be a pre workout supplement without it. Using the latest formulations in the bodybuilding supplements industry to date the team at Cellucor have created yet another top pre workout supplement to maximize gains and fuel you though your workout. We all look forward to more great things to come from this company and the result we get from their supplements. This entry was posted in Bodybuilding, Supplement Review and tagged Arginine, Beta-Alanine, bodybuilding, Bodybuilding supplement, Creatine, nitric oxide by Russell Jensen. Bookmark the permalink.